It’s Instant Pot Friday and today’s new recipe is – INSTANT POT CHICKEN CURRY. Be ready to be blown away! When you eat this Instant Pot Chicken Curry you will feel like you’re eating at the finest Indian restaurant in town. Instant Pot Chicken Curry served with rice and cilantro. 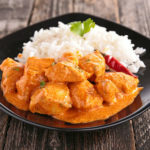 Chicken curry is a classic recipe where chunks of chicken are stewed in an onion and tomato based sauce that is flavored with various spices. 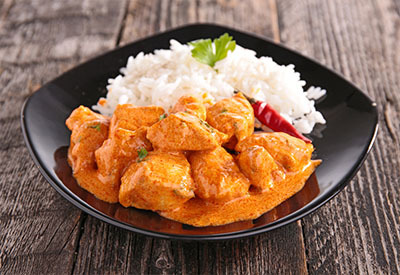 There are many variations of chicken curry spices and sauces that are used throughout the world. This recipe calls for both whole spices and ground spices to provide maximum flavor to this dish. You can find Garam Masala at specialty grocery stores in the Indian cuisine aisle or you can also order it on Amazon. The basic onion and tomato sauce is spiced up with the addition of the jalapeno. However, if you don’t like your curry spicy, you can either deseed the jalapeno or omit it altogether. Instant Pot Chicken Curry is easy to make. Just saute all the ingredients directly in the pot and then pressure cook for only 5 minutes! With quick release pressure, your meal will be on the table in no time! We typically serve our chicken curry over a small bed of rice. However, you could eat it without the rice or served with Naan. Due to the popularity of the Instant Pot Pressure Cooker, we will provide you with a new Instant Pot recipe every Friday! Check out our other Instant Pot recipes. Simple yet delicious Instant Pot chicken curry recipe with lots of flavor in a thick sauce. Cut the chicken into 1-2 inch chunks. Turn Instant Pot to Sauté mode and add oil to it. Heat and add the whole spices and sauté for 30 seconds. Add the tomatoes and ground spices. Continue to sauté for 3 minutes, while stirring at regular intervals. Add the chicken and sauté for another 3 minutes. Add the broth and stir. Cancel sauté mode. Add lid and set on sealing. Set to manual/pressure cook mode on high for 5 minutes. Once cooking is complete, quick release the pressure and stir in the lemon juice. Remove bay leaves and whole cloves. For a less spicy dish omit jalapeno pepper. Is this the type of curry that gets rasins and pEanuts, etc. Lon top? I have never put raisins or peanuts on top before. It’s delicious without any additions. Made this last night. Start to finish it took me over an hour, does that seem right? I always seem to be wasting time waiting for my IP to warm up, whether on a dish like this or soup. Thanks! Hi Marie In my 6 quart Instant Pot I can make this recipe in about 30 minutes. It takes about 15 minutes of saute time and then about 10 minutes to come to pressure with 5 minutes of cook time. It might be a little longer to come to pressure depending on your altitude, but an hour does seem like a long time for this recipe. It does take longer for my pot to come to pressure when it is full of liquid (example: stock). Got it, thanks! I guess it makes sense that it takes more time to come to pressure when full of liquid. Thank you for the response! !